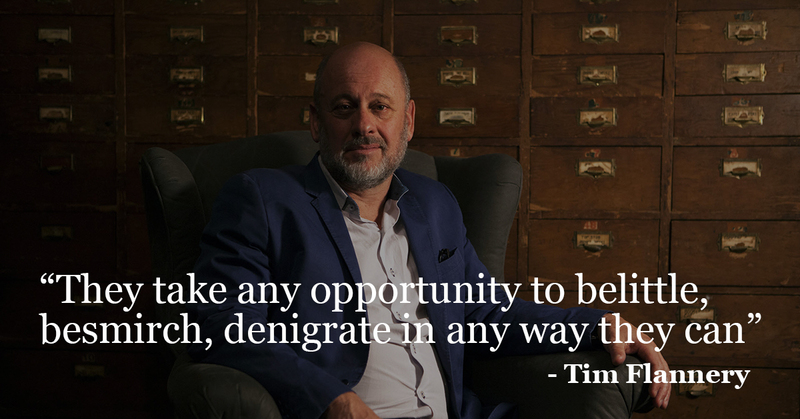 On Australia Day 2007, scientist Tim Flannery was named Australian of the Year at a ceremony on the lawns of Parliament House. “He has encouraged Australians into new ways of thinking about our environmental history and future ecological challenges,” declared then-prime minister John Howard as he presented Flannery with the award. For The Australian, this was too much to take. In its news story, the Oz reported Howard as having “embraced his inner greenie”, and in its editorial said the decision would be “a controversial choice for some”. In the year that followed, The Australian published 72 pieces that were either about Flannery or mentioned him — many of them negative or disparaging, often describing him as a climate “alarmist”. Until the commission was scrapped in 2013, almost every story about him referred to Flannery’s “tax-payer funded” salary. It was used as an example of the excesses of the Gillard government’s spending in an editorial on September 20, 2013: “The cutting of former chief commissioner Tim Flannery’s $180,000 part-time salary for spruiking climate alarmism is a stark signal of a return to evidence-based and practical policy”. In 2011, when he first started in the role, another editorial said Flannery was “not a bad bloke, but he would not have been our choice for climate commissioner, a three-day-a-week job for which he will be paid $180,000 a year”. That’s not to mention all the news stories including the same piece of background. The report quoted an online forum that had a post saying “doomsayers such as Professor Flannery, after having frightened the elderly to sell their seaside properties, are buying them”. The accusation was wrong and The Australian eventually published a correction a few days later after Flannery hired a QC to apply pressure. One of the paper’s main allegations against Flannery was based on his comments in 2005 and 2007 that if climate patterns continued there could be trouble with Sydney’s water supply. And in 2007, speaking to the ABC, he referenced a report about increased evaporation rates. He says the point he was making was that we couldn’t assume dams would fill as they previously had — not, as The Australian reported, that the dams would dry up. Flannery insists he was being taken out of context, such that the paper could portray him as an alarmist or fanatic (which became a common feature of its descriptions of him). In 2015, then-editor-in-chief Chris Mitchell summarised his view of Flannery when he told his own paper that The Australian’s Graham Lloyd was the smartest environment writer in the country “by light-years” and could “run rings around clowns like Tim Flannery in any forum on knowledge of the science”. Flannery, a passionate, internationally recognised scientist and author, acknowledges that if you want to create change “you’ll create many enemies”. But in the case of Australia’s national broadsheet, he says, “they take any opportunity to belittle, besmirch, denigrate in any way they can”.